A pretty choice to send your best wishes. A gorgeous decorated flower pot design just perfect to convey your Get Well Wishes… The flowers are hand-embellished with a smattering of crystals, flowers, butterflies, buttons and finished with a hand tied polka dot satin bow. 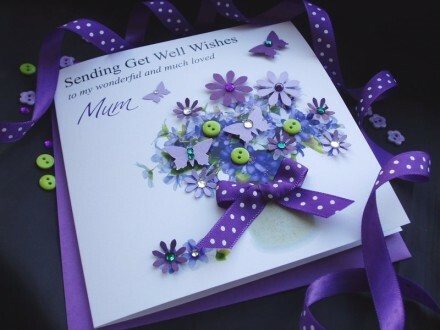 This handmade Get Well Card is teamed with a matching square envelope, protected in a sealed cellophane bag and sent to you in a double board outer envelope to ensure it arrives in pristine condition.